Deliver a superior customer experience by providing the ability to sign and pay from almost anywhere in the world on most devices. Spend more time growing your business instead of chasing down payments. Prevent inaccuracies caused by manual processes to ensure you get paid the right amount. 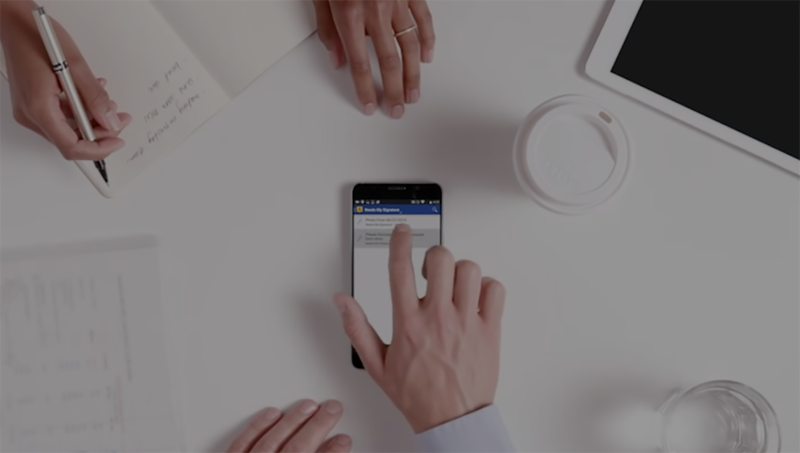 With quick setup time, a platform that is secure and PCI-compliant, and a flexible, intuitive mobile-friendly interface, DocuSign Payments makes it easy for you to collect electronic payments sooner. How does DocuSign Payments work? DocuSign is developing pre-built integrations with the leading payment gateways so businesses can collect payments using DocuSign. What payment methods can I accept from customers if I use DocuSign Payments? 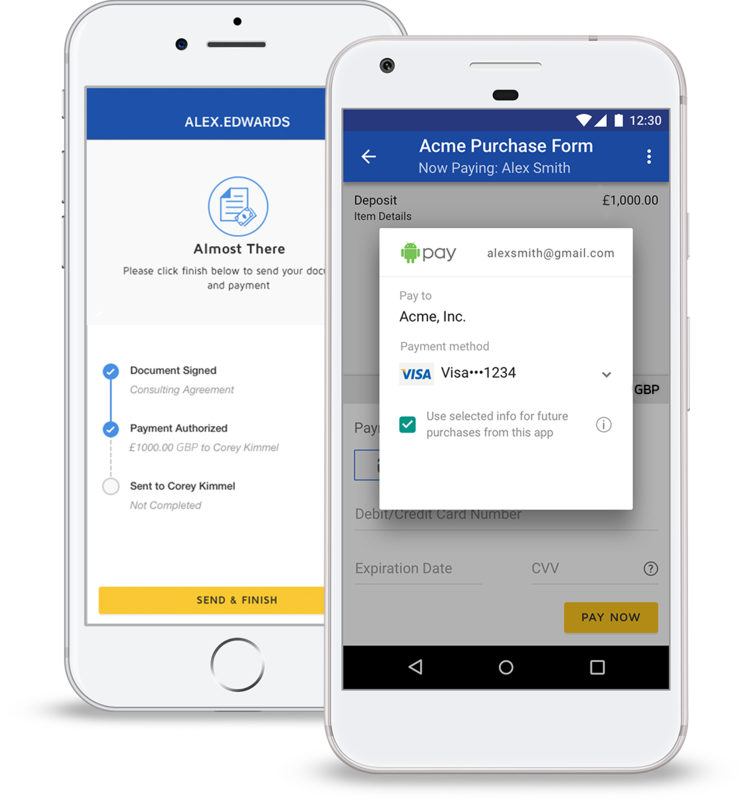 With DocuSign Payments, you are able to accept major credit cards, debit cards, Apple Pay and Android Pay. Acceptable payment methods are dependent on the payment gateway you decide to use. You need a payment gateway to accept online payments from customers. A payment gateway is a service that sends payment details to the payment networks for processing. When a sender gathers a signature and collects a payment from a signer, DocuSign will submit the transaction to the sender's selected payment gateway for routing to the payment networks. Do I need to sign up with a payment gateway to use DocuSign Payments? Yes, you will need to sign up or have an existing account with a DocuSign-supported payment gateway. Currently, Stripe, Authorize.Net and Braintree/PayPal are the payment gateways available. What information from DocuSign Payments will be passed through to the payment gateway for reporting purposes? DocuSign passes through to the payment gateway the envelope ID, recipient name, email, and optional Product Name, Product SKU, and Product Details fields as metadata. What countries is DocuSign Payments currently available? DocuSign Payments is available in the U.S., UK, Canada, and Australia. Is DocuSign a merchant of record, payment gateway, or payment processor? DocuSign is not a merchant of record, payment gateway, or payment processor. DocuSign will be integrating with payment gateways so you can easily log in to your preferred payment gateway within the DocuSign sending experience to request payments. Once the customer signs up to a selected payment gateway, they will become the merchant of record. The merchant of record is the organization that is held financially liable by the acquiring bank. When a customer of DocuSign assumes responsibility as merchant of record, they are held liable by the financial institution that processes the end consumer’s credit and debit card payments. This includes all full and partial returns to the consumer’s card, as well as any chargebacks initiated by the consumer. They also take on tax and compliance risk to ensure digital transactions are handled with precision, and full compliance with local laws. Will credit card numbers be automatically saved and stored with DocuSign? DocuSign does collect the credit card data but does not process the card or store the data. In signing, there is a form that collects signers’ credit card data if a payment request is included in the envelope. That is a DocuSign-hosted form, so we do collect the credit card data. The credit card data is then passed from the form, through our servers (in temporary memory only), to the payment gateway, along with some payment details (e.g., the amount). The payment gateway then sends a response to DocuSign to let us know that it is a valid card with sufficient funds for the transaction – authorizing but not charging the payment request. The payment gateway also passes us a token which allows us to later request that credit card be charged, but only one time, and only in the same amount that was authorized. We do this so we can process the charge when the envelope is complete rather than at the moment of signing, so that our customers don’t have to issue refunds when envelopes void. What notifications are sent when payment is completed? All DocuSign notifications will be sent to the customer when the envelope is completed, which is confirmation that a payment was charged and posted. The customer can also configure its payment gateway account to notify the customer and/or payer of the payment posting. How much does it cost to use DocuSign Payments? DocuSign Payments is included in Business Pro and Enterprise Pro plans. A customer still has to pay the relevant payment gateway transaction fees. How much are the payment gateway fees I need to pay? Transaction fees for each payment gateway differ. Braintree/PayPal: 1.9% + 20p per transaction; outside home currency - additional 1% fee applies. AMEX transactions will be charged 2.4% + 20p. If you are a high volume customer, it is recommended you contact the payment gateway directly to negotiate discounted pricing.